I take it as a sign that I have not completely failed as a father that my 11-year-old baseball-obsessed son’s favorite player is Jackie Robinson. And so it was with some excitement that I shared the news last Tuesday (Jan 31) that it was quite a day for baseball birthdays: Jackie Robinson, Ernie Banks, and Nolan Ryan all on one day. My son reacted with all the ennui and exasperation that a preteen can muster at the dinner table when dad tries to start a conversation. 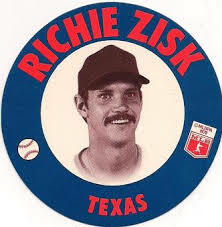 My wife asked “Are you going to write about one of them for your blog thing?” I politely responded that I would not – those players are all far too well known for “Better Know a Ballplayer.” Instead, I announced, I was thinking of Richie Zisk for the upcoming entry. Zisk is not completely unknown – ask the Board of the National Polish-American Sports Hall of Fame where Zisk is a 2004 inductee. But Zisk is no Robinson, Banks, or Ryan. My wife responded to this news, remembering my writing about Kurt Bevacqua, that Zisk is worth 17 points in Scrabble. Unprompted. Without looking it up. I married up. for brief cups of coffee as a corner outfielder in 1971 and 1972 for some great Pirates teams. Zisk made his debut on September 8, 1971 by replacing Roberto Clemente in right field in the top of the 8th with the Pirates leading 10-0. Zisk singled in his first at-bat in the bottom of the 8th as the Pirates wrapped up that game 10-1. Zisk wouldn’t officially qualify as a rookie until the 1973 campaign, when he brought his formidable mustache to bear on the hole in Pittsburgh’s right field opened up by the untimely death of Roberto Clemente following the 1972 season. With only 333 at bats in 1973, Zisk slashed .324/.364/.526 (147 OPS+) establishing himself as a valuable major league hitter. Even as a corner outfielder, his defensive value was always limited, as he accumulated a dWAR of -9.6 in his 13 seasons. However, that solid rookie offensive output was followed up by a strong 1974 campaign in which Zisk became a solid part of Pittsburgh’s “Lumber Company” with a line of .313/.386/.476 (145 OPS+) as the regular right fielder, good enough for 9th place in NL MVP voting. went from a member of the “Lumber Company” to one of the “South Side Hit Men.” This trade has provided us with gems such as signs at Comiskey which read “Pitch at Risk to Richie Zisk,” a can of RC cola with a picture of his hairy upper lip, and this video whose uniforms constitute a trigger for Chris Sale. Mr. Sale, please do not watch the video! Oh, and that 17 Scrabble score for his last name? That’s the number of home runs he hit for the Pirates in 1974, his first year as a full-time everyday player. It is also the high for stolen bases in a season (achieved twice, in 1921 and 1923) by this guy, who shares a birthday with our man Richie Zisk.